This is a piece of jewellery I have been working towards for some time. Sourcing the materials posed a challege, but I am now very proud to have created the first pair! 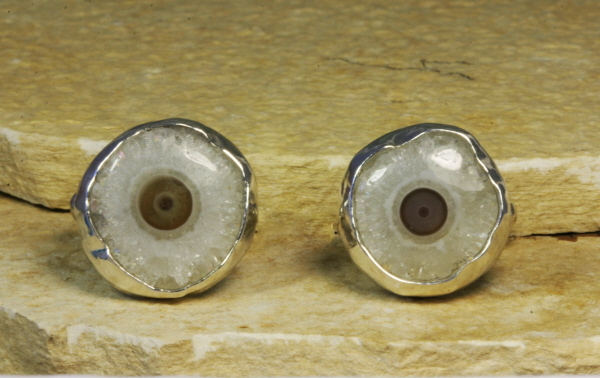 These cufflinks are made with genuine slices of a Stalactite. I am sure you will all be familiar with these beautiful objects found hanging from the roofs of underground caves across the World. These are largely quartz based Stalactite material - and the tubes have been sliced into thin sections and highly polished. You can see the concentric circles within the slices which show the endless years it took for the Stalactites to form as water drip drip dripped from the roof of the cavern. I have set two matched slices in custom made solid silver settings and set them with sterling silver cufflink fittings. This process takes a LONG time, as each slice is slightly different in size and shape. The cufflinks measure 1.5cm across and are beautifully boxed in a lovely black velvet lined jewellery box. TRULY unique and would make a great talking point on any mans arm!